Time to talk about what fish were and are biting, ones that migrated away and some we hope show up for your upcoming charter fishing trip with Relentless Offshore Adventures!!! 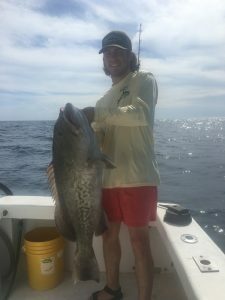 Well, I wouldn’t say that the grouper were firing last month, but there were definitely a few around. 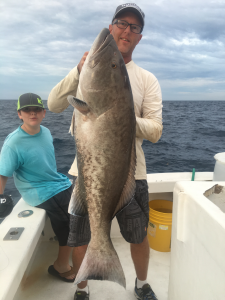 We all hoped that the opening season would reflect the numbers of the last month of closure, but apparently, the grouper had different plans. Obviously, a good portion of them decided they would rather migrate back towards North Carolina than end up grilled, fried or broiled in Florida. Even so, there were enough grouper around to keep things interesting. Like I mentioned above, there weren’t a pile of grouper around, but plenty of bottom fishermen managed to catch from one to a few per boat. Personally, on the Relentless II, the most gags we caught in one day were four (we caught four on several occasions). Also, I witnessed several catches between 3-5 on other boats. While not ‘limits’ of grouper caught, these were very respectable landings. In addition to the grouper, the amberjack were biting pretty decently. There were a bunch of limits brought in throughout May. As if the grouper and aj’s weren’t enough, some spots were loaded with banded rudder fish. I still haven’t eaten a rudder jack yet and I’ve been getting mixed reviews from my clients, but either way, they’re fun to catch. For June, I would expect the bottom fishing to remain relatively the same as long as water conditions remain good. Bring plenty of live bait as the rudder fish and red snapper can eat you out of boat and home. Most of the action will be from the 23 fathom ridge on out to the cones. In the deeper water, fishing will likely be dictated by the current. If the current is too strong, the fishing will be very difficult. If the current is on the light side, fishing could be spectacular. The live bait fishing was a bit spotty last month. The fish would be there one day and gone the next, then back the following day. If I had to guess, some of this was probably due to the wind blowing several nights and making the ocean rough. At least, some of the fish were a decent average size. And, there were really some pretty good catches, despite the unpredictability. Also, the bait was a bit tough last month, acting similar to the kingfish. With a little luck, both the kings and bait will settle into a slightly more reliable pattern, like the pogies are at the brown condos and the fish are on 8A. With the kings, there should be a few cobia, mahi, sharks, jack crevelle and a possible blackfin tuna or wahoo. Word to the wise, be prepared to throw the cast net a few or more times to capture your bait! If you’re one of those people who only wants to catch dolphin, be prepared for a long day. After the numbers we saw in April, May was quite a let down. The run lasted nearly three weeks, but it was a bit early in the year. By the time May rolled in, the run was tapering off as the fish moved north. There were still a few decent catches, just nothing like April. For June, I would expect the mahi fishing to remain on the slower side with just one here and one there, nothing consistent. Either way, get out there and enjoy some of the awesome weather! Stay shaded, sun screened and stay hydrated! See ya on the pond!!! Book your Port Canaveral deep sea fishing trip with me, Captain Scott!